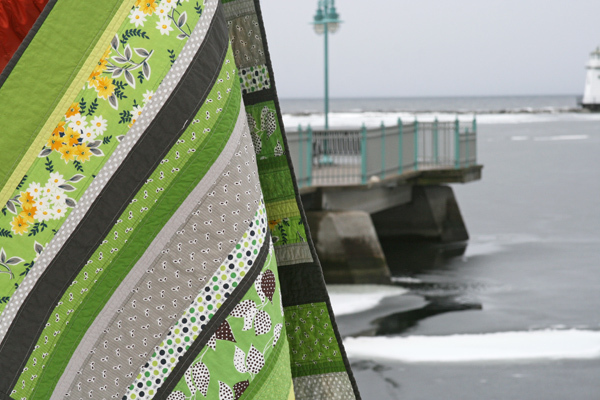 I really like the mix of green and gray – that gray fmf seed print is one of my favorites, and I’ve managed to sneak a bit of it into each of my recent quilts. 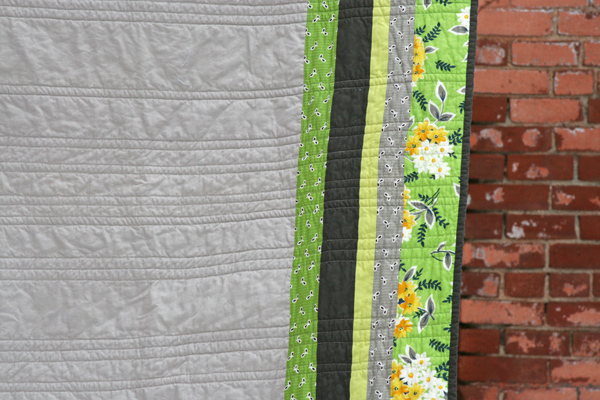 As with previous strip quilts, I’ve quilted this one with straight lines along each seam line. I like that the minimal quilting keeps this quilt nice and soft, and I always love the pattern it creates on the backing. Speaking of, I went with a lighter gray solid for the backing of this one so that you’d be able to see those quilting lines. And of course a couple extra strips of the printed fabrics for good measure! This one measures about 40″ x 57″ and is now listed for sale in the shop. 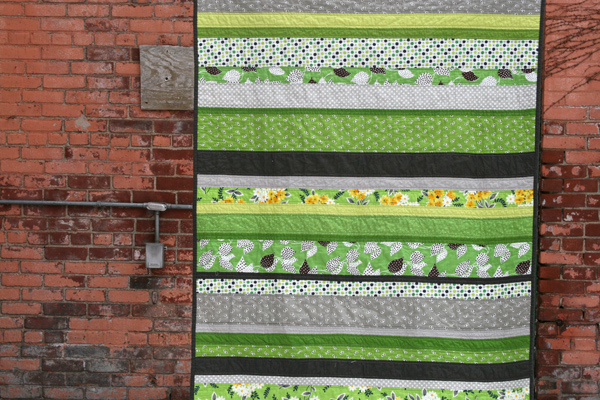 This entry was posted in [search] Strip Quilts, Finished Quilts, Posts about Quilts, Quilts and tagged denyse schmidt, flea market fancy, green and gray, handmade, kona solids, quilt, quilting, strip quilt. Bookmark the permalink. LOVE IT. everyday I think ‘no, this one is my favorite…’ but you being that this one is green, it wins. I think. though I can’t be sure. Your work is sooo lovely!! Very pretty and quite appropriate colour scheme for this week. Love those strip quilts! Keep those pictures coming. This one is so cool…love the combo of fabrics. I love the colors on this one. Thanks for the posts on all these strip quilts, I love them! I have never made a quilt but hope to do one this year – these look like something even a hopeless sewer that I am can try! I love the quilt. I just finished a green scrap strip table runner for the Rainbow Scrap Challenge I’m in. I like green so much I might have to make a quilt also. I can’t even tell you how much I love the colors on this quilt! It’s beautiful! Wow. You must have quite the stash of Denyse Schmidt! 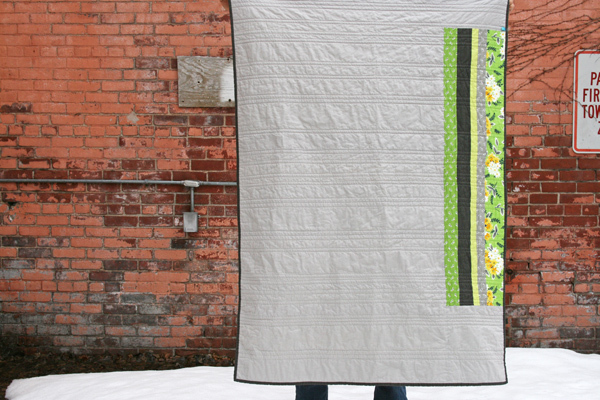 I love this quilt, the greens & the prints are lovely. I had been making strip quilts at the start of winter & your recent posts have got me in the mood to start again! it is gorgeous!! i love the green and grey together!! It’s beautiful, Ashley! The green is so cheerful and springy……. I really am liking greys right now… love the quilt. The back is super nice too. Very Nice – I like the varying widths of the strips. Thank you for sharing photos of all these cute quilts. Oh, and the gray back is a great choice. Where or where can I get my hands on some of that fabric line!?!?!? It’s gorgeous!! so super cute!!!!! love it! Beautiful! I absolutely love it! 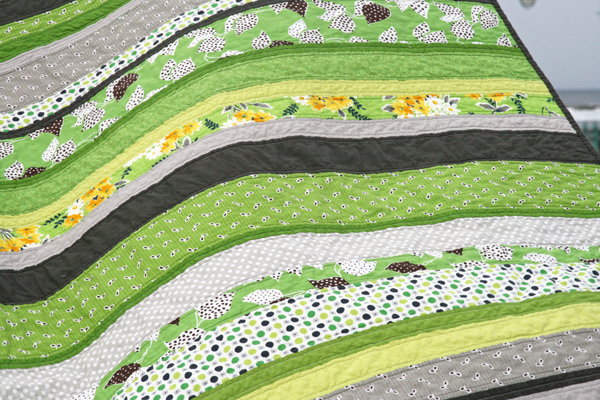 Not sure if it’s the greens or the strip quilting… Thanks for sharing! I am green with envy! Ha! I wish I would have thought to do something like this before I swapped my leftover FMF. I just took apart my FMF quilt top becuase I didn’t like it. Now I’m left with a stack of pieced scraps that aren’t speaking to me. Hmmm…what to do…I think while I’m thinking about it, I’ll stare at this one cause it’s a gem! OMG I love that fabric so much. I went home last night and whipped one up for a baby shower I have to attend this weekend, but I did it like a giant string block and did the quilt as you go method. I’m now adding some cute hand quilting to it. Feel free to check out the post on my blog. Love all of your projects!! you know, i’ve always wanted to mention how i love your quilt backs… i love how you add a bit of play to the back, a lot of people ignore it. nice to see, and i love the green! I would love to know where you find all your beautiful fabric!! It is all so gorgeous! I need to take a class on learning to find good colors that coordinate together, I feel all of mine are too safe! I read a lot of interesting articles here.